I appreciate I could be accused of pushing things a touch here by including Steve Ellis’ Love Affair in my list of attended Rock ‘n’ Roll concerts, although Ellis does have a bit of rock in his CV (viz Seventies band Widowmaker). And there is no doubt that for a brief spell around 1968 he was a pop star of some renown. Indeed I am decrepit enough to remember both Rainbow Valley and Everlasting Love in the charts, and The Love Affair was the first group of which I would call myself a fan. In that I actively sought out their songs on radio and TV, and awaited each new release with anticipation. No, I suppose my reticence for including this one, is that the gig took place some 25 years after Ellis had last graced the charts and was him appearing on some sort of nostalgia tour; not quite on the chicken-in-a-basket circuit, but pretty close. The concert took place at The Cavendish in Edinburgh, a venue with quite a chequered history. Although a popular ballroom since the Second World War, it really came to prominence with the declaration of The Punk Wars in the late Seventies where it went under the name of Clouds. As punk evolved into new wave, the place became Coasters and I can recall seeing both Julian Cope and Soft Cell perform there during the Eighties. Later, it was briefly known as The Network I think, but by the time of this gig had reverted to one of its earlier names: The Cavendish Ballroom and was promoting itself as a Nite Spot for the (ahem) more mature and discerning clubber. “Jurassic Park” it was colloquially referred to locally, famed for its Grab-a-Granny nights. I should perhaps like to point out here that I was not in attendance to grab anyone’s granny, but had pitched up with a group of workmates following a Xmas meal at a nearby restaurant, enticed along by the prospect of seeing playing live one of the earliest bands I can remember from my childhood. Honest. 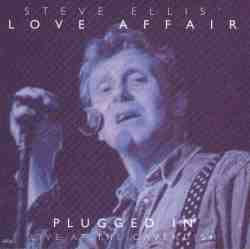 I say band, but of course Love Affair circa 1994 was little more than vocalist Steve Ellis and a troupe of (no doubt extremely competent) session guys. I remember thinking at the time that four hit singles from 1968 did seem a rather flimsy back catalogue upon which to base a whole gig. But Ellis solved this problem by spending the first hour or so belting out Sixties standards, such The Small Faces’ All or Nothing and Wilson Pickett’s In the Midnight Hour. Eventually he reached those two big Love Affair hits from '68, and it is probably not very cool to admit it, but I just grinned in recognition as at a meeting with very old friends.